Welcome everybody. Thank you for attending our 39th AGM! Our Membership is maintained at just under 500 paid-up members – a slight decline, but nothing too significant. Do encourage your friends to join. We need this strength to argue our case with Merseytravel and Mersey Ferries! With regard to Policy matters, our cordial relations continue with Cllr. Liam Robinson, Chair of Merseytravel, and Gary Evans, Head of Consumer Delivery (which incorporates the role of Chief Officer in charge of Mersey Ferries). Nevertheless, as you will have learnt from my Chair’s letters to you in the last year, we were given little time to respond to the limited consultation period allowed with regard to the publication of thr Mersey Ferries Long Term Strategy. We were able to meet them on 29th December, only about a week before the report was considered by the Merseytravel Committee. about aiming for a cost neutral budget for the Ferries, the value of Heritage assets, the commuter service, the future of the Royal Daffodil, and the basing of the Manchestere Ship Canal cruise vessel at Ellesmere Port. We have now had sight of the Consultants’ Report – a lengthy document one has to scroll through on the computer screen, and so far I have yet to find detailed information on why the Royal Daffodil should not be brought back into service, or the full rationale for the closure of Woodside stage. I wonder in fact if these were “givens” when the Consultants were engaged. Neither have I unraveled the costs of new-build ferries versus the cost of maintaining the existing fleet – people travel on Heritage railways to be pulled by an historic steam locomotive, not a modern diesel. As far as I am aware, the hulls of the existing vessels are sound, even if the Royal Daffodil does need new engines. In a similar vein, we were told that removing Woodside as a stop would be beneficial to passengers – my view is that berthing and setting off from a stage was part of the ferry experience! We will have to remain alert as Merseytravel begins to implement its Strategy in the coming months and years. Financially, Friends have had another successful year with a surplus for the year of over £1900. Our Dock and River Cruise and Christmas Draw were responsible for much of this. Our thanks to Malcolm, our Hon. Treasurer, for his paintaking work in managing our money flows - he has more details later in his report. Our Hon.Publicity and Marketing Officer, Joan Roberts, is in charge of Sales. Once again she has attended numerous events and fairs during the year advertising our Society in the wider world. Greatly helped by John Timms, she has generated funds for the Friends through sales, membership subscriptions, and her famous picture raffles. Our grateful thanks to both for the considerable time spent organising and running the stalls, and the significant public relations value which the work has accumulated. Hon.Membership Secretary Gordon Ditchfield has not only brought in our Subscriptions, but is also responsible for organising the ever-successful Christmas Draw, and making the Dock and River Cruise arrangements. Many thanks to him for carrying out these duties. I’d also like to thank our Newsletter Editor, Geoff Holmes and our Hon. Secretary David Hocker, and all the other members of the Committee - Bob Peers, Terry Edgar and Andrew Blizzard - who have contributed to the smooth running of Friends’ activities. The Committee is able to consider co-opting persons prepared to join the Committee. Our Dock and River Cruise on 20th June last year again had fine weather, and numerous ships were observed on the river and in the docks. Our commentators Andy Ball and Stuart Wood really enjoyed the day, and will be back this 25th June. Get your tickets this evening – and help sell some to your friends and colleagues! Mersey Ferries have been very helpful in selling the tickets at all three terminals, and advertising our Cruise in their literature. Our Website is now up and running again, relatively inexpensively, with the help of a professional firm “Designated” based at Vale House, Vale Park. We are very pleased with the outcome, but we will probably need additional expertise to update it from time to time! Your Committee will continue to monitor Mersey Ferries activities on your behalf, and it will be interesting to see what policies emerge as Merseytravel becomes part of the active Liverpool City Region organization. I look forward to seeing you all on our Cruise on 25th June. Hon. Chairman Friends of the Ferries across the Mersey. The Friends of the Ferries across the Mersey Committee is alarmed by the recent turn of events, and has asked me to write to you with our views on the present situation. In recent years, Mersey Ferries and Merseytravel have maintained that two ferry vessels are adequate to operate services, a concept which we have always opposed. The problems suffered by Mersey Ferries during this summer and autumn highlight the deficiencies of a two vessel fleet. The Royal Daffodil remains laid-up costing money without contributing to revenue. We wish to know exactly what problems she has with her engines, and any other issues following dry-docking a few months ago. As we have said previously, we think she is ideally equipped internally for chartering to the burgeoning Liverpool Conference market, for both “break-out” meetings and leisure trips. At £1000 per hour, she could earn for example £200,000 per year from forty 5 hour charters. This type of work would impose minimal strain on her engines. By accepting charters which avoid the morning and evening peaks, and the Manchester Ship Canal trip-days, the vessel would be available to deputise for the more critical elements of the services if necessary. With regard to the pressing problem of the 2017 Merseyrail Tunnel closures, we note that Mersey Ferries simply say they will maintain the existing service with a back-up vessel if required. We have no explanation why the morning and evening peak Woodside commuter service, using the back-up vessel, is not to be restored for the duration of the closures. There is no word even about restoring an earlier peak hour evening service from the Pier Head to Seacombe after 4pm. At Hamilton Square there are many rail passengers who park their cars in the vicinity of the station; who arrive on a “kiss and ride” basis; or who travel there by bus. A peak 20 minute Woodside Ferry service would reduce the demand at Central and Birkenhead North stations for rail replacement buses to Liverpool; reduce tunnel congestion by encouraging car drivers not to take their cars through the tunnel; and would increase bus patronage to Woodside. In view of the likely problems at James Street Platform 2 during the restricted rail service from February to May, we would suggest that the Woodside Ferry service should operate during this period also. (Should the worst happen, and one vessel breaks down, a basic 30 minute triangular service would operate as in previous years, serving both Seacombe and Woodside). tickets for the greatly underused bus park at Woodside. (If necessary some buses could lay-over at the bus stands). Many people will be inconvenienced by the closures, and by the intermediate- period restricted rail service to James Street, including the inevitable and uncomfortable overcrowding, and a congested bus trip through the Tunnel. A ferry service will minimise discomfort, and may even be quicker for many, (A single boarding point for Mann Island bus services would help those travelling towards Lime Street). The extra funding of an enhanced ferry service would represent a very small proportion of the total scheme costs, while at the same time improving the reputation of both Mersey Ferries and Merseytravel! As a courtesy, I am copying this letter to Gary Evans, with whom we normally correspond. We look forward to your response and are happy to attend a meeting to discuss the matter further. Chairman, Friends of the Ferries across the Mersey. Click here to see Councillor Robinson's response. Our mixed-weather Easter is over, but at least we now have longer days to enjoy, which hopefully will be warm and sunny for trips on the ferry! 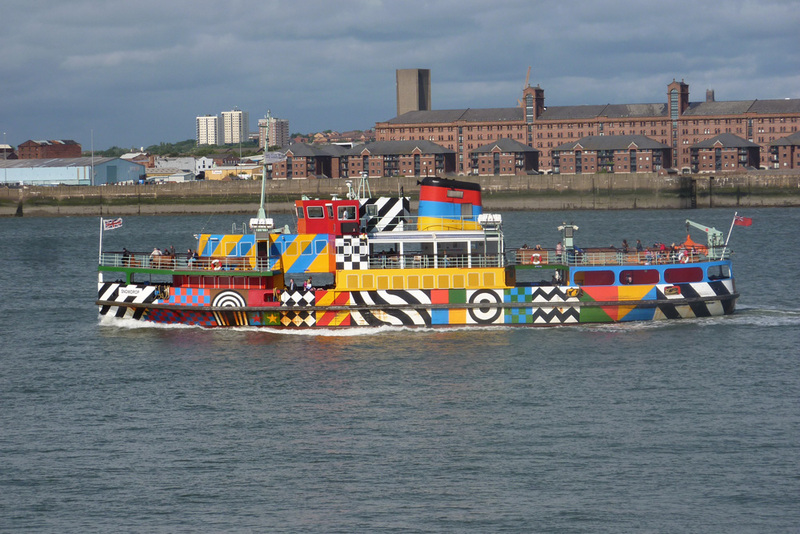 Use the Mersey Ferries web for the timetable. (On this topic, please note we now have our new web-site, as above). Since I last wrote to you, Merseytravel has published its 25 year Long Term Strategy for Mersey Ferries, accompanied by strident protests from bodies outraged by the proposal to eliminate the Woodside stage. Following our meeting with Merseytravel’s Chair in Spring 2015, we had anticipated the publication of the Consultant’s Report, and sought a meeting last Autumn, but we were unable to discuss the contents with Merseytravel until late December – only a week before a report went to the Merseytravel Committee. The Chair did give us a personal presentation of the Report’s contents, but we only obtained a copy later. Meanwhile, we hurriedly compiled our comments on the major issues we had, and submitted a letter to the Chair and elected members of Merseytravel for their meeting. A copy of this letter is enclosed, and you will see our concerns relate chiefly to the economic prosperity of Wirral in the new City Region, and the opportunities for Birkenhead which lie ahead. Closure of the Woodside stage would have an adverse effect on this. Other issues referred to include: balancing the budget prematurely, the future of the Royal Daffodil and other heritage assets, the commuter service, and the Manchester Ship Canal cruises. We welcomed, however, the principle of looking ahead to the future. At its meeting, Merseytravel approved the broad strategy, but resolved that “officers be requested to look at options around all three terminals; Pier Head, Woodside and Seacombe; that should include a future three terminal service.” This form of words provides some comfort, but the phrasing allows more wriggle-room than we would prefer. On the river, we have confirmation that Cammell Laird will build the new Polar Exploration vessel, to be completed in 2019 – a great coup for the firm. Meanwhile, HMS Caroline, a C-class cruiser built by them in 1914 has been refurbished in Belfast and will be open to the public on 1st June as a museum and conference centre. She is the last survivor of the Battle of Jutland (1916) and carried 325 crew at 28.5 knots, with 4” & 6” guns and torpedoes. After 1922 she was a training and administration centre. Joan Roberts is again busy at local fairs, and pleasingly is making steady progress after a recent fall and hip bone operation. 18th May at Birkenhead YMCA, when our Malcolm McRonald, marine author and cruise-liner lecturer, will speak to us. Although we have had a very reasonable summer, followed by dry and warm weather extending into November, Mersey Ferries has had a miserable time. This was due to the May closure of the Ship Canal by a fallen bridge, a July accident to the Royal Iris off Eastham Locks requiring five months of repairs, and an October breakdown of the Snowdrop immediately prior to its annual refit.. Consequently, there have been few Canal trips this summer, and no ferry service this Autumn for nearly a month. Mersey Ferries and Merseytravel have argued in recent years that operations can be maintained with only two vessels – a policy which we have consistently rejected. We have written to the Chair of Merseytravel, again urging that the Royal Daffodil be brought out of lay-up to provide a back-up facility, funded by revenues generated by off-peak charter work in our booming tourist and conference market for which she is admirably suited. Redoubled efforts are required by the marketing department of Mersey Ferries to restore confidence and win back disappointed customers. An opportunity will arise between 3rd January - 12th February and 30th May - 18th June, when the cross-river Merseyrail system will be shut down. As Wirral rail service between 13th February - 29th May will only operate 6 car trains at a reduced frequency to James Street platform 2, many passengers may well prefer to continue on the Ferries during this period, too. Our Cruise this year was very well supported and plenty of shipping movements were observed in both the river and dock system. In fact, the Gladstone and Langton Locks were so busy that for the first time in about 30 years we were unable to enter Seaforth Dock. We also passed the new Liverpool 2 container terminal, where a trial docking at the open river quay was taking place. The £400 million project occupying 50 acres of reclaimed land was completed for a formal opening on 4th November 2016, and can accommodate the largest container ships. The aim is to attract those vessels with Northern England cargoes now sailing to Felixtowe or Southampton. We thank our commentators Stuart Wood and Andy Ball who enjoyed their day with us. The provisional date for our 2017 Dock and River Cruise is 27th May 2017. On other river news, it was pleasing to see Sir David Attenborough, the naturalist, carry-out the keel-laying ceremony at Cammell Laird on 17th October of the British Antarctic Survey vessel to be named after him. The £200 million vessel (hull no.1390), to be completed in 2019, is reported to be the largest commercial shipbuilding project in the country in 30 years. More recently, Princess Anne named the container ship Atlantic Sea at the Pier Head Liner Terminal. Part of the ACL fleet renewal, the ship just fits the Gladstone Lock. In attendance on the river, with a tootle on her whistle, was the newly restored Ship Canal steam tug Daniel Adamson, captained by Stuart Wood. She carries 100 passengers and 12 crew. Please find enclosed our Newsletter by Geoff Holmes, and tickets for our ever-popular Christmas Draw run by Gordon Ditchfield. Membership receipts or reminders are also enclosed. Joan Roberts continues to attend local events and fairs with her sales stall - see some items below for Christmas presents! Very best wishes to you all for Christmas and the New Year! We would like to thank you and Gary Evans for the time you spent with us on 29th December explaining the elements of the Strategy prior to its consideration on 7th January. We welcome Merseytravel’s initiative in examining holistically the future of the Ferries, and developing a long-term Strategy. We have had no contact with the Consultants, and at the time of writing we have not been able to see the Consultant’s Report and the range of detailed information therein. Nevertheless, the Strategy outlined in the Executive Summary contains, in our view, flaws which we request Merseytravel Members to address, and to amend the Strategy accordingly.